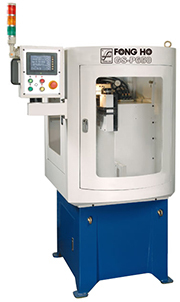 Designed for auto chip breaker slot grinding machine at a time. Touch-sensing screen provides easy operation and adjustment and fast accomplishment. Cross and vertical movement are operated by air power. Slot depth setting is made by mechanical adjustment. 15,000-5,0000 rpm extra high spindle speed makes the machine excellent for chip breaker slot grinding on H.S.S and T.C.T circular saw blade. * The manufacturer always performs product improvements to achieve the best possible performance. All specifications, dimensions and design characteristics shown in this catalogue are subject to change without notice. Product specifications are based on the actual machines. The manufacturer holds explanation rights. Please visit www.machine-video.com and enter the code MT212. You may view the digital CATALOG or VIDEO on line.